Over the years Professor Iwaniec was invited as a keynote speaker thus presenting the keynote address in the areas of her particular expertise, e.g. emotional abuse and neglect, and failure to thrive in children, at the following conferences. 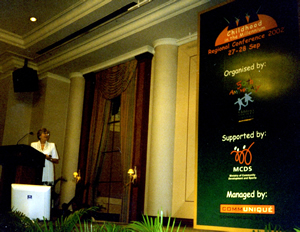 Childhood in the Millennium conference held in 2002. Canadian National Symposium on Failure to Thrive. Identifying and Helping Children Who Fail to Thrive. Toronto, Canada, 1984. World Congress of Behavioural Psychotherapy. Emotional Abuse and Failure to Thrive. Edinburgh, 1988. National Conference on Emotional Abuse. Prevention and Treatment of Emotionally Abused Children. Dartington, 1994. 11th ISPCAN International Congress. Emotional Abuse and Growth Failure in Children. Dublin, 1996. Children in Crisis Conference. Identification and Assessment of Emotional Abuse. Leeds, 1996. Fictitious and Fabricated Illnesses and Failure to Thrive Conference. Children Who Fail to Thrive. Edinburgh, 1997. Millennium Lecture on the Marginalised Child: Parental Responsibility. Dublin, January 1998. 2nd Millennium Lecture on the Marginalised Child: Child Welfare – The State Responsibility. London, October 1998. European Congress in Cognitive and Behavioural Psychotherapy. Parent Training for Parents whose Children Fail to Thrive. Cork, 1998. IFCO European Fostercare Conference. Multidimensional and Multidisciplinary Approach in Helping Children who are in Foster Care. Cork, 2000. Threats against Childhood Conference. Children at Risk. Bialobrzegi (near Warsaw, Poland), 2001. Childhood in the Millennium conference. 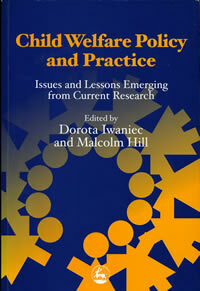 Identifying and Protecting Children from Emotional Abuse and Neglect – Identification, Assessment and Intervention. Singapore, 2002. ACPC Conference on Emotional Abuse and Fabricated and Induced Illnesses. The Effects of Emotional Abuse on Child Growth and Development. Truro, Cornwall, November 2002. Emotional Abuse of Children. Identification and Assessment of Emotional Abuse and Neglect. Hasselt, Belgium, 2004. 2nd Eastern European Behaviour Analysis Conference. The Influence of Parents on Children’s Behaviour: The Effects of Parent-Training on Children who Fail to Thrive. Gdansk, Poland, 2005. Professor Iwaniec has given many invited papers at national and international conferences, in Toronto, Montreal, Hamilton (Canada), Hong Kong, Czech Republic, Oslo (Norway), Chicago (USA), Waterford (Republic of Ireland), and in many cities in the UK, such as London, Birmingham, Manchester, Oldham, Hull, Southampton, Glasgow, Winchester, Newcastle-on-Tyne, Rochdale, Bristol, Huddersfield, Leicester, Belfast, Newcastle (Co. Down), Armagh, etc.